Deposit: Payment in full at time of booking. 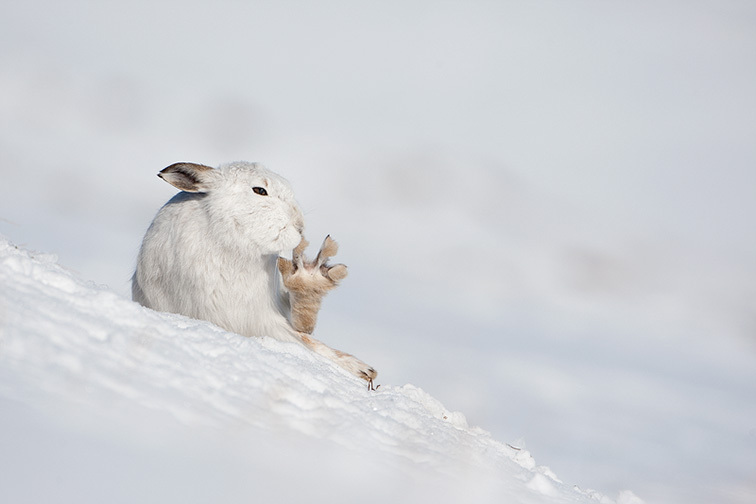 This is a fantastic opportunity to photograph mountain hares in their white winter coats at the best location within Scotland under the tutelage of an expert photographer/ naturalist with an intimate knowledge of the speices who will guide you to the best spots where you'll be able to capture a wide range of amazing images. 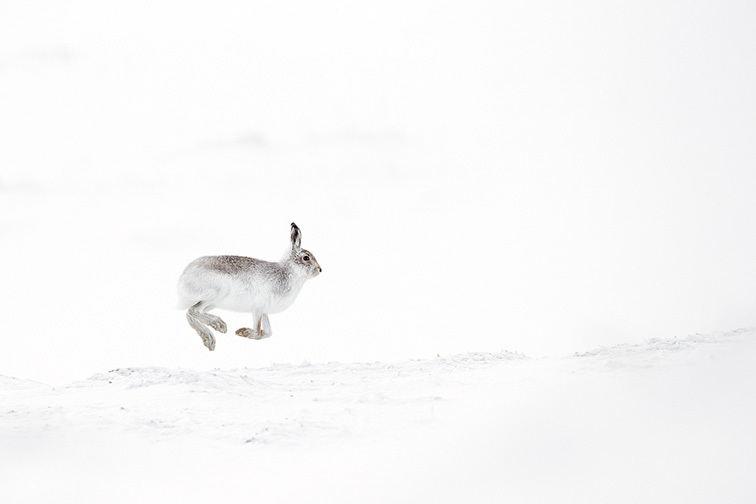 The hares are distributed over a wide range in an upland environment and you can expect to see a good number of animals with a range of photographic opportunnities over the course of the day. 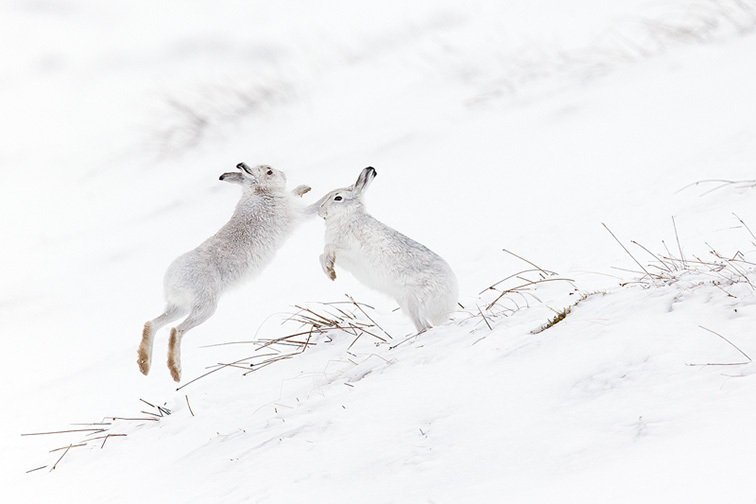 From mid-february onwards mountain hares begin to enage in courtship behaviour, which involves high-speed chases and boxing, as well as mating. 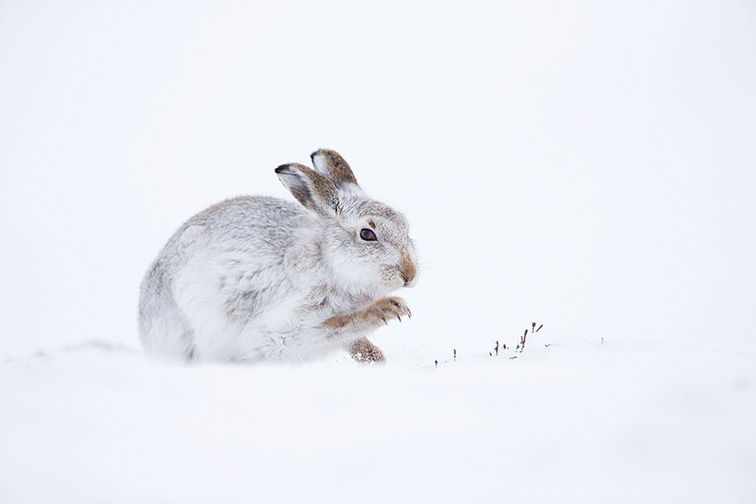 If a female in-season is encountered it is not uncommon to find several male hares in close proximity with an increased chance for action and close-up images. 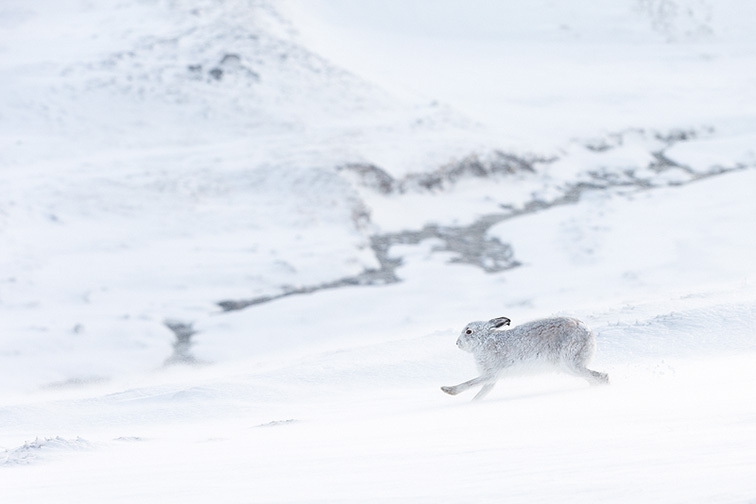 There are also times when it is advantageous to remain with an individual hare for long periods, waiting for some specific behaviour to unfold or to capture the perfect shot. 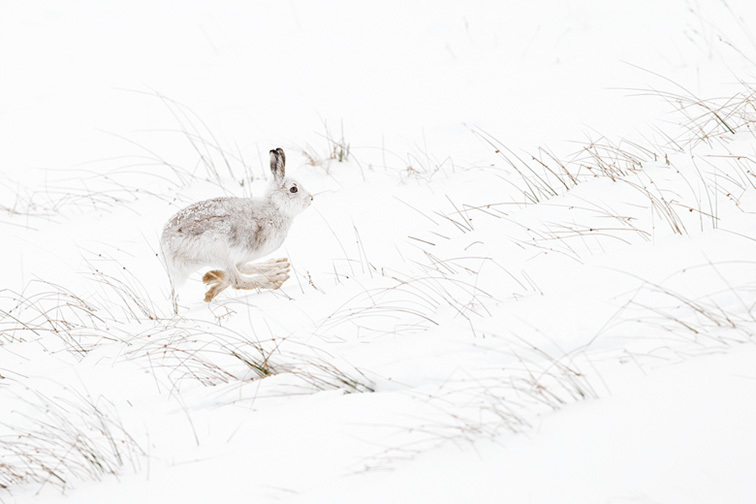 The approach to the site is on foot and it is possible to locate hares on the lower ground after a 20 minute walk. 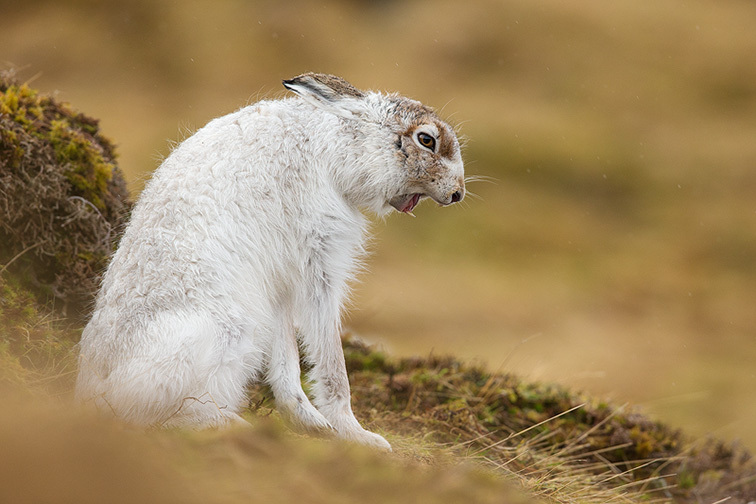 Depending on conditions and fitness levels the aim will be to move uphill looking for hares before reaching the higher plateau where hares are most numerous. 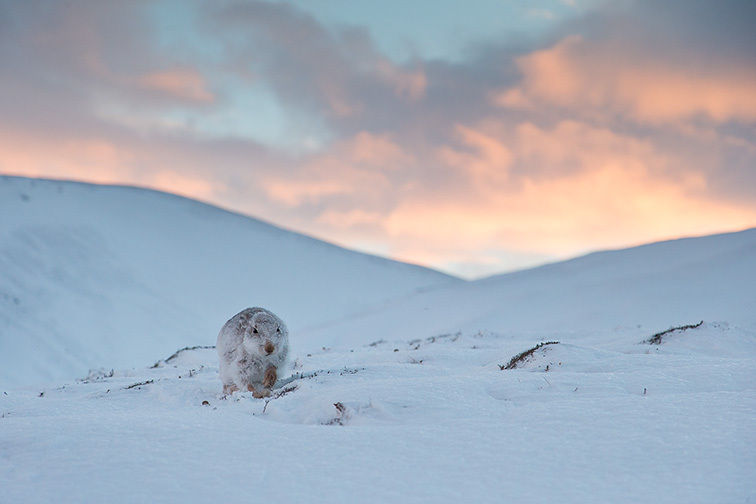 This involves a walk of around 1 mile and an elevation gain of around 250-300m. 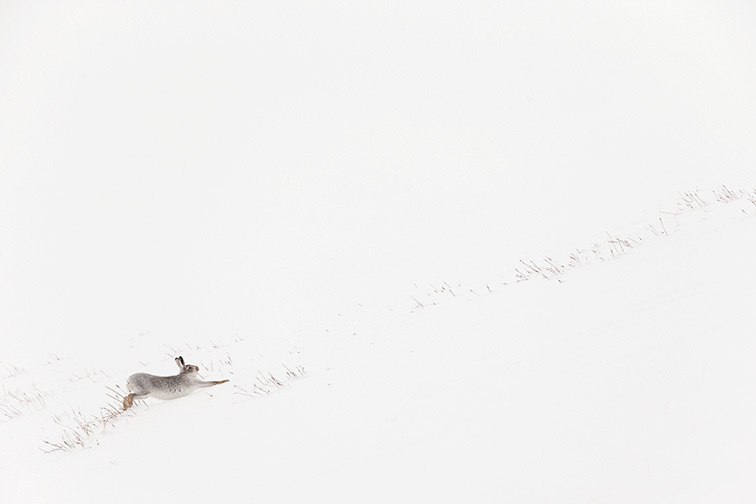 The ground is moderately steep in places, uneven and can be slippery in snowy or icy conditions. 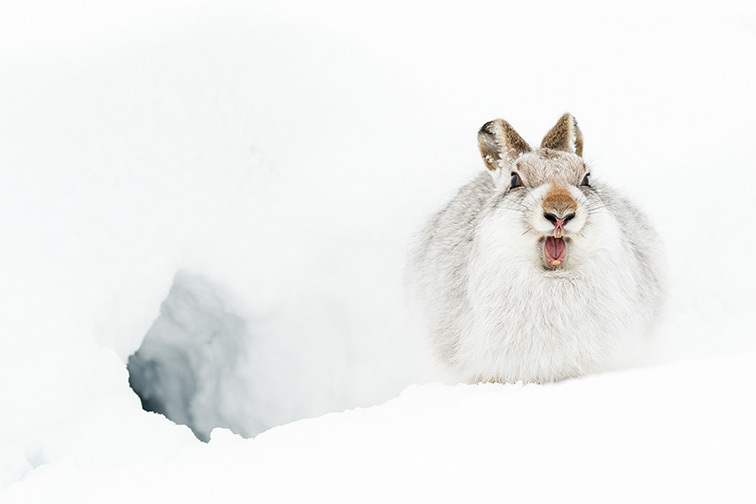 Snow cover is very variable during the winter and they may be none at all or there could be more than 0.5m. 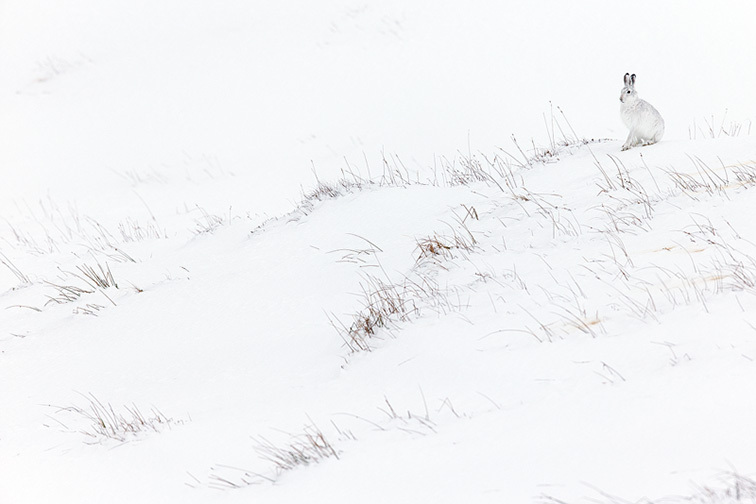 Walking in snow in this kind of terrain is tiring and requires a good level of fitness and stamina, especially considering that you will be carrying heavy photographic equipment, although the pace will be slow and breaks can be taken! 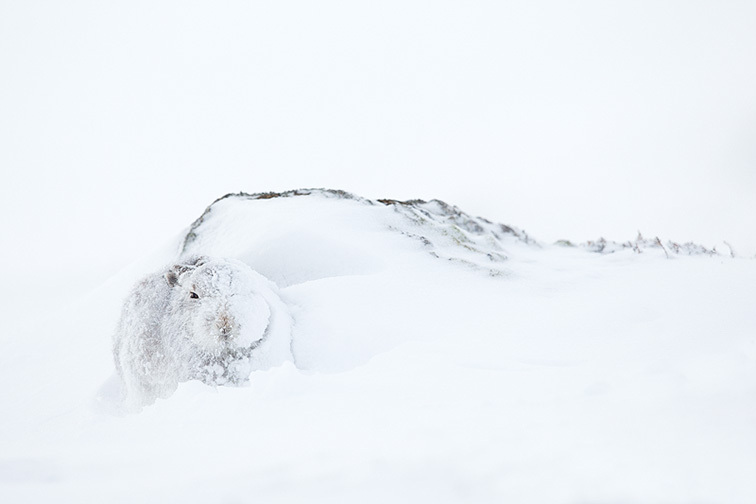 Mountain hares are mostly white in winter and are perfectly camouflaged in the snowy terrain making them difficult to spot but they have favoured areas where they rest up during the day. 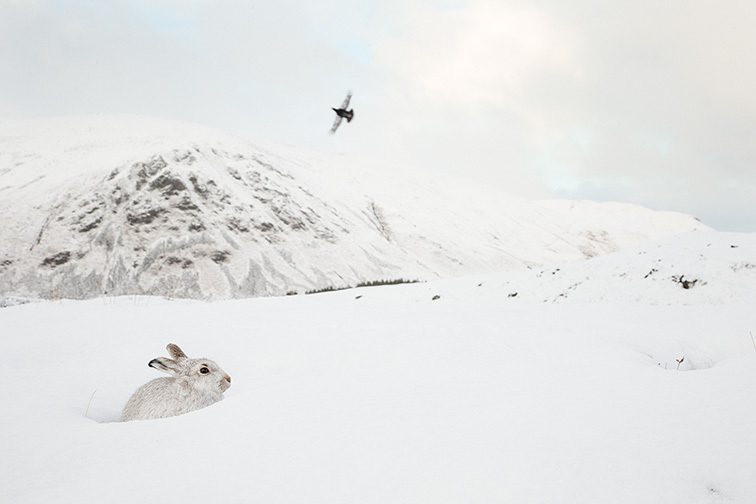 Once a hare has been spotted a slow and careful approach will be made to hopefully get within photographic range. 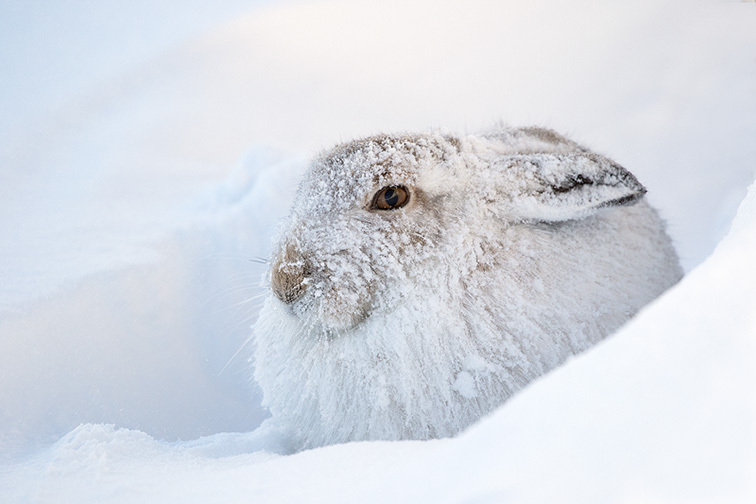 Although some hares flee at the first sign of a human many others rely on their camouflage and stay partially hidden allowing for a much closer approach. 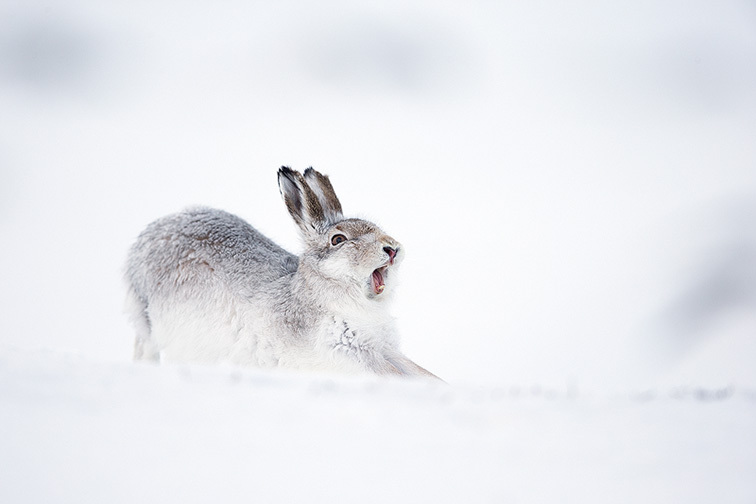 Moving into position can take some time and it’s important that the hare remains relaxed and comfortable. 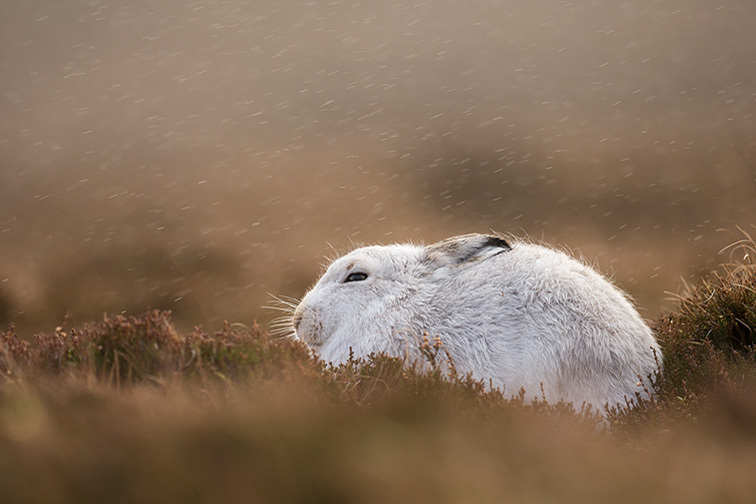 Hares will often sit in the same position for hours if undisturbed and so it may be a waiting game hoping the hare will become more active, start to groom or stretch. 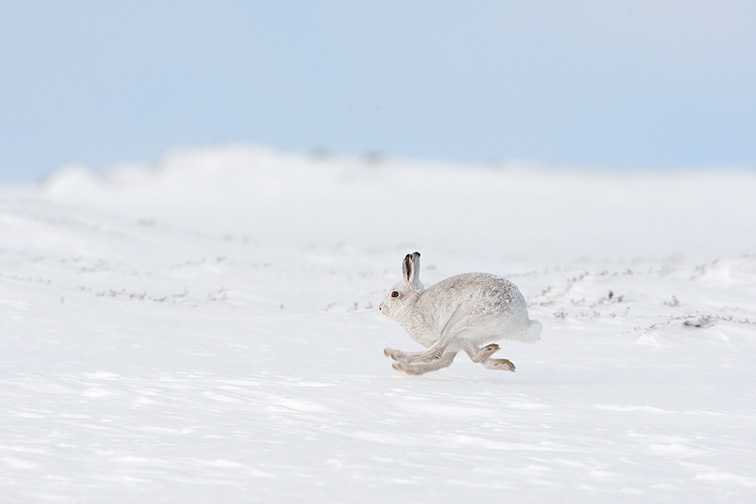 If pushed, then most hares will eventually flee running off away from the camera so we want to avoid this by being patient and waiting for things to happen naturally. 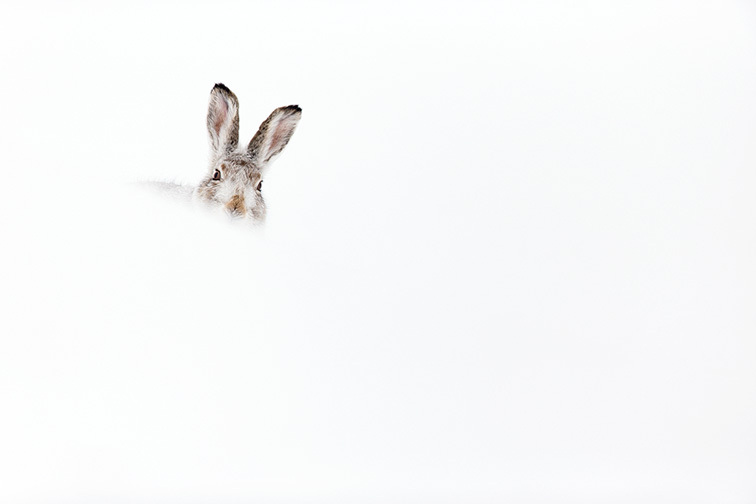 Your guide will be on hand to offer advice on how to best approach the hares, as well as helping with camera settings, exposure etc. Note that you may well be sitting, kneeling or even lying on wet cold ground for periods of time so you should wear adequate clothing and be prepared for this. You will be away from your vehicle all day and the session will begin at 0930 and usually end at around 1600. There are no facilities on site. 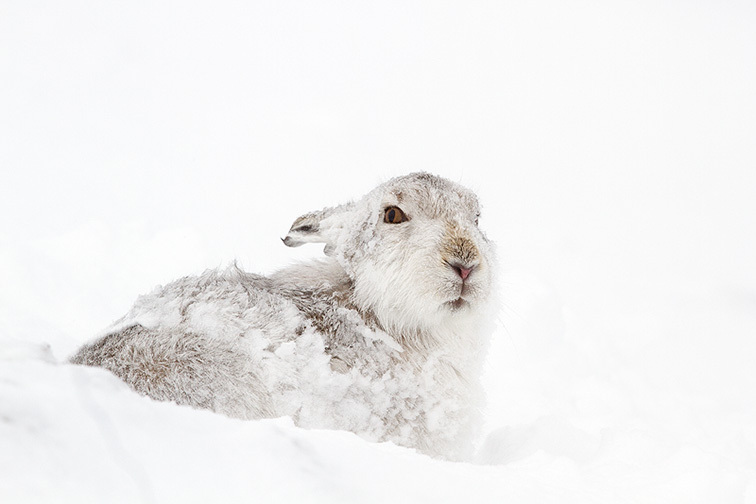 Access to the meeting point is on a narrow tarmac road that is ploughed in snowy weather but there is the potential for ice and slippery conditions.